As a family dentist serving the dental health needs of Macon and the larger, Central Georgia community, Dr. Amber Lawson is committed to offering her patients the best in care and service. To these ends, Signature Dentistry of Macon has moved to their new location at 1495 Forsyth Street, Macon, GA. 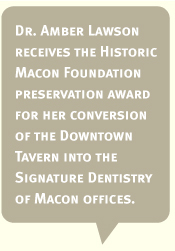 Located in the historic Vineville area of Macon, in the old “Downtown Tavern” building, Signature Dentistry is down the street from the Medical Center of Central Georgia and around the corner from Mercer University.